Officials at the Ducab Aluminium Company launch. Ducab, a leading manufacturer of cabling products, has joined hands with top UAE-based industrial investment holding company, Senaat, to set up a new aluminium company in Khalifa Industrial Zone Abu Dhabi (Kizad). The new entity - Ducab Aluminium Company (DAC) - set up at an investment of Dh220 million ($60 million) aims to boost the UAE’s industrial supply chain in line with the UAE strategy to champion industrial investments. It will manufacture 50,000 metric tonnes of quality electrical grade aluminium rod and overhead conductor per annum once it reaches its full capacity supplying to both local and international customers, said a statement from Senaat. 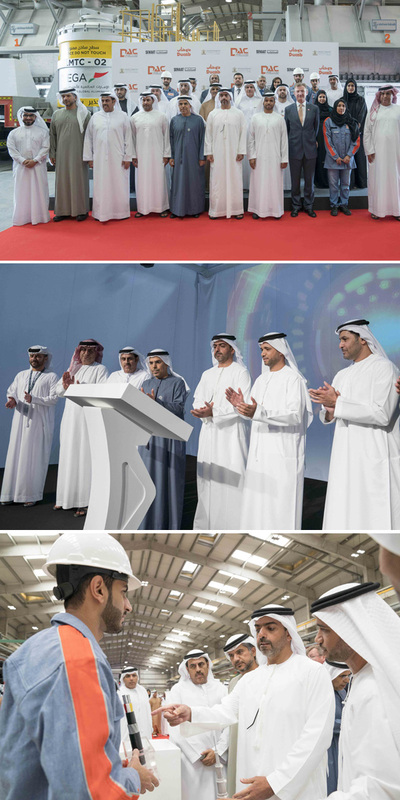 The company was officially inaugurated by Sheikh Hamed bin Zayed al Nahyan, the Chief of the Abu Dhabi Crown Prince’s Court, at a ceremony held in Kizad which was attended by ministers and other senior leaders and executives. The joint venture embodies the efforts to expand the development of the industrial sector in the UAE by embracing the partnership model that combines national industrial sector organizations in Abu Dhabi and Dubai. DAC co-operates with Emirates Global Aluminium (EGA) to supply the new manufacturer with molten aluminium in a unique collaborative model to promote partnership strategies among national institutions. Although EGA’s aluminium is the second biggest ‘made-in-the-UAE’ export, an increasing proportion of its production is sold locally. There are 26 downstream companies in the UAE making products using EGA’s metal, including DAC, said the statement. The UAE aluminium sector as a whole employs some 30,000 people, making it the largest employer amongst the UAE’s energy-intensive industries. DAC’s facility has been built close to EGA’s Al Taweelah aluminium smelter, one of the largest in the world. EGA supplies DAC with molten aluminium along a dedicated ‘hot metal road’, the first in the UAE to link separate industrial sites, it added. “We welcome the official inauguration of DAC, and look forward to reliably supplying them with the metal they need to make their products in the years to come,” he said. Jamal Salem Al Dhaheri, the chairman of DAC and Ducab and CEO of Senaat, said: "Through our company we will emphasise the competitive edge for ‘Made-in-UAE’ products, with 100 per cent UAE-made aluminium rods and overhead lines replacing imports." “We have signed a multi-year contract with EGA for the supply of aluminium to our facility, and we are well-positioned to optimise local resources that are customised to various industries’ requirements, in line with the Abu Dhabi Economic Vision 2030,” he added. Receiving molten aluminium from EGA eliminates the need for DAC to use high energy to re-melt the metal before use. This saves both costs and environmental emissions. Captain Mohamed Juma Al Shamisi, CEO of Abu Dhabi Ports, too lauded Ducab and Senaat at the opening of their new facility in Kizad. "The UAE has become, thanks to the unlimited support from our wise leadership to public and private sector entities, a leading player in industries such as aluminium and conductors and has built world-class factories and manufacturing facilities to meet the growing global demand for such industrial material," noted Al Shamisi. “The inauguration of DAC at Kizad, one of the region’s largest progressive industrial and logistic hubs fully integrated with Khalifa Port, offers DAC unrivalled advantages such as world-class infrastructure, integrated transportation and road network with direct access to Khalifa Port,” he said.